With three forms of premium grade protein (isolate, hydrolysed and concentrate), as well as a comprehensive amino acid profile, Precision Engineered Whey Protein Pumpkin Spice tastes great, and is the perfect choice for your training and fitness goals. Derived from milk, Precision Engineered Whey Protein is natural source of protein, and is ideal if you have an active lifestyle, or want to increase your protein intake. Precision Engineered Whey Protein is perfect post workout or in-between meals to keep your protein levels topped up. For adults, blend one 60ml scoop to 125ml of water, juice, milk or yoghurt. For best results use an electric blender and once mixed the product should be consumed within 20 minutes. For best results, take one to three servings daily. Do not exceed stated dose. 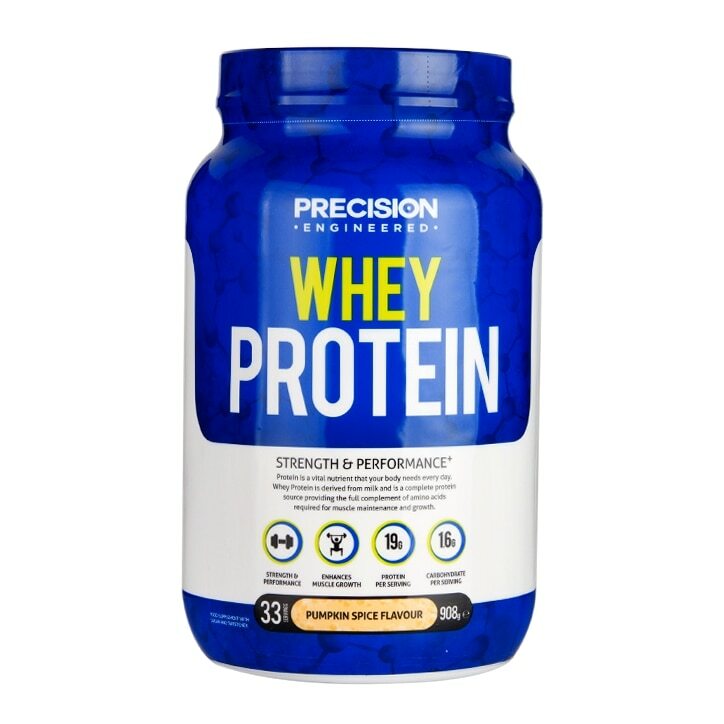 You can drink Precision Engineered Whey Protein any time during the day to add extra high quality protein to you daily kilocalories provided by milk, juice, yoghurt or whatever you may add to your Precision Engineered Whey Protein. Ensure adequate hydration during and after training – Minimum of six to eight glasses of water daily. Protein Blend (Whey (Milk) Protein Concentrate (WPC80), Whey (Milk) Protein Isolate), Hydrolysed Whey (Milk) Protein, Pumpkin Spice Flavouring, Emulsifiers (Soya Lecithin, Acacia Gum), Sweetener (Steviol Glycosides), Maltodextrin, Coconut Oil, Sucrose, Antioxidants (Sodium Ascobate, dl-Alpha Tocopherol), Beta Carotene, Anti-Caking Agent (Silicon Dioxide). Precision Engineered Whey Protein Pumpkin Spice is rated 4.0 out of 5 by 7.